When you begin to play Dirty Split, you would be forgiven to think of it as a commercial game. There is so little that gives away its freeware nature, mostly the short longevity. All the rest denotes an obvious commitment to create an outstanding adventure game. The story places us in the shoes of a private investigator, Alan Baxter, who has to solve a murder. A successful plastic surgeon has been murdered and an innocent arrested. Case closed. Or maybe not, since the suspect is from a wealthy family, the Vanderbuilt. Now it’s up to us to find the real killer and dig through all the lies and deceit. 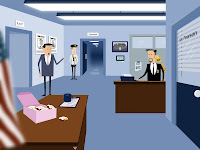 Dirty Split was created by Dreamagination Entertainment and released on June 2008. The visuals are striking and very uncommon, and deserve all praise. Everything from the characters to the scenarios are perfectly designed, it all fits superbly and gives the game a retro feel, Austin Powers style. Colors are well chosen and animation is incredibly consistent, just in the right places. Some cool effects bring the drawings to life, like the glitter of a TV screen or the traffic of a New York street. Playing Dirty Split comes almost naturally, since the interface is so well thought-out. The right-click brings up the three possible actions: examine, use or talk. Moving the mouse to the top of the screen shows all the objects we are carrying, and it’s also possible to combine them. The game features quite some dialog, proposing some choices and occasionally even a couple of clever puzzles. The graphics are great, but the voice work is phenomenal. All of the picturesque characters, main and secondary, have the most appropriate voices. From the crying young lady to the concierge or the exquisite motel receptionist, they fit perfectly into the look and personality. The jazz music adds to the retro atmosphere, with some different and interesting tracks. There is also frequent and competent use of sound effects. Dirty Split is an absolutely stunning free game. The two or three hours it takes to finish this adventure is the only downside, but just because we wanted to continue exploring this brilliant work. Graphics and voices are all spot-on, the story twists and turns near the end and everything just looks like an extremely professional production. Don’t miss this one.